April 10, 2019 | Categories: Updates | Comments Off on THIS SATURDAY: Grand Opening of the New Park Central! 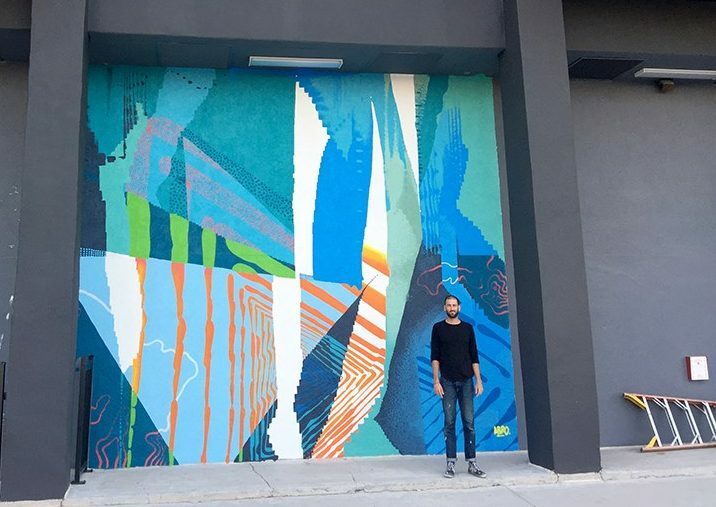 Park Central Mural Finalists Announced! 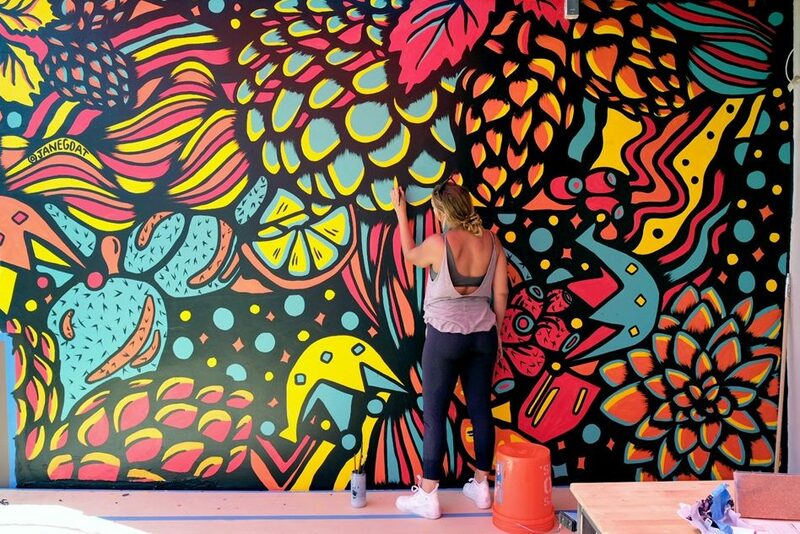 Park Central Mural East— Finalists Announced! Monday, December 3, 2018— The owners of the newly-renovated Park Central have partnered with Artlink Inc. to spearhead the development of an Arts and Culture Plan for their site. The first public art call stemming from this process was Park Central Mural East— a key feature on the east facing side of Park Central, near the main entrance from Central Avenue. This eye-catching mural will be an important amenity as it is a significant focal point of the entire project. Today, we’re very pleased to announce the selected Finalists! A private development, Park Central engaged several people connected to the project for the selection panel, including representatives from Plaza Companies, Holualoa Companies, DPR Construction and the Park Central Advisory Committee— a group made up of project leadership, industry professionals, and arts advocates and practitioners. Per the call’s stated criteria, finalists were chosen on “the quality, originality, and craftsmanship of their past works and potential to make a significant artistic contribution to this project”. Each finalist will be paid an honorarium to develop a site-specific proposal from which ONE artist and design will be chosen. The winning design will showcase the strength and feasibility of the proposed concept through a creative approach, as well as the design’s potential to engage tenants and visitors to Park Central in a meaningful way. Congratulations, Jane, Andrew, and Lauren— the Finalists! Want to be the first to hear about featured artist opportunities? Become an Articipant! Or, subscribe to the Artlink LINKLETTER to see our featured public calls! December 3, 2018 | Categories: Artist Opportunities, Calls, Updates | Comments Off on Park Central Mural Finalists Announced! Art Detour, Phoenix’s original art walk and the longest running arts festival in downtown Phoenix, will return for its 31st year March 14-18, 2019. The annual event, produced by Artlink Inc., a 501(c)3 nonprofit, was launched by Phoenix artists in 1989 and will feature a five-day, multi-faceted exploration of the arts and culture of America’s fifth-largest city. The community is invited to detour through the city and celebrate our artistic surroundings over a delightful weekend of cultural discovery. 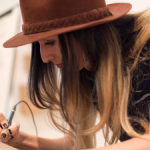 Patrons can meet artists in their working environments, start or expand their art collection, and immerse themselves in Phoenix’s arts and culture venues. Detour-ists will be invited to step into approximately 100 artist studios, galleries, pop-up spaces and other venues, as well as enjoy performances and Kids’ Detour family-friendly activities. Event Schedule: The five-day event format will kick off with the opening night Art d’Core Gala celebration; span the weekend with scheduled and self-guided explorations of artist studios and exhibition spaces; and end with a symposium that will spur interest in art collecting, foster artists’ career development, and identify actionable items to create a culturally rich and economically diverse city. Articipate! 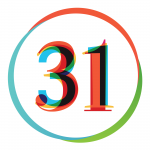 Central Phoenix galleries, arts businesses, and arts-supporting businesses that register as an Artlink Articipant will be identified on the official Art Detour 31 map. Artists (student, emerging, professional) are encouraged to register as Articipants to be included in Artlink’s NEW ArtistsAZ directory, which will be promoted throughout Art Detour 31. Watch for calls to artists on artdetour.com and Artlink’s social channels. Read Articipation registration details here. Partner: Support the year-round efforts of Artlink Inc. by becoming an official partner. Review details here. Where: Approximately 100 artist studios, galleries, arts and culture venues and arts-supporting businesses in the Central Phoenix area. Who: The five-day experience is made possible through the Articipation of hundreds of contributing artists. Hosts: Art Detour 31 is produced by Artlink Inc., a 501(c)3 nonprofit, in partnership with the City of Phoenix Office of Arts & Culture, Downtown Phoenix Inc., the Arizona Commission on the Arts, Park Central and in collaboration with Roosevelt Row CDC, Historic Grand Avenue, Phoenix Warehouse District, Central Arts District and many more. Getting Around: Artlink provides an event calendar, map, and transportation options for easy navigation of the Detour. Maps and an online calendar powered by Phoenix Urban Guide (PUG) (phoenixurbanguide.com) will guide patrons through the five-day event. Artlink will provide complimentary docent-guided trolleys from transportation partner Dunn Transportation on Friday, Saturday and Sunday. The event is also easily accessible by Valley Metro’s Light Rail and GRiD Bikes. 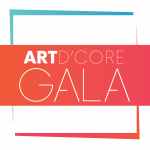 Thursday, March 14 – Art d’Core Gala! – The opening night celebration is a fun spin on a traditional “gala” that each year spotlights the significant contribution of the arts in creating a dynamic city. The event will showcase works by members of the Artlink Artist Council (AAC) paired with works by exciting emerging artists. Learn more here. Buy tickets here. Friday-Sunday, March 15-17 – Patrons are invited to embark on a self-guided weekend of arts experiences across Phoenix’s key arts districts; from Roosevelt Row and Historic Grand Avenue to the Downtown Phoenix Core, Phoenix Warehouse District and Beyond, visitors can venture into galleries, art studios, art supporting-businesses and unique pop-up installations. Further details on exhibitions and special Detour performances and events to come! Monday, March 18 – Save the date! 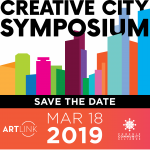 The Creative City Symposium is developed in partnership with Phoenix Community Alliance and and hosted by Phoenix Art Museum in support artists’ careers and to identify actionable items to create a culturally rich and economically diverse city. Details to be announced. Go to ARTDETOUR.COM to sign up for updates. Read more and sign up for updates on ARTDETOUR.COM. 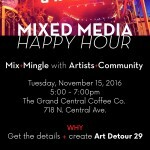 November 7, 2018: Join Us for a Mixed Media Happy Hour! 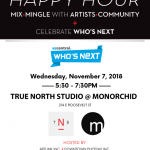 November 5, 2018 | Categories: Artist Opportunities, Calls, Updates | Comments Off on November 7, 2018: Join Us for a Mixed Media Happy Hour! Simple Ways to Support Artlink! April 23, 2018 | Categories: Updates | Comments Off on Simple Ways to Support Artlink! April 20, 2018: LINKLETTER for April’s Third Friday! 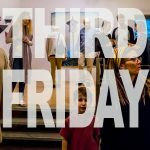 April 20, 2018 | Categories: Newsletter, Third Friday, Updates | Comments Off on April 20, 2018: LINKLETTER for April’s Third Friday! 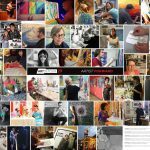 Artlink Inc., a Phoenix-based nonprofit whose mission is to keep the arts integral to the development of our city, announces new “Articipation” opportunities to fully embrace the Phoenix artist community and further support their pursuit of successful careers in Phoenix. Coinciding with the upcoming 30th anniversary of Art Detour March 15-20, 2018, Artlink’s new offerings seek to both lower the economic barriers of engagement and to expand definitions of participation to better serve the artist community. 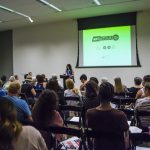 Since 1989, Artlink has supported a variety of community-based art events, including complimentary Trolley Tours during the monthly First Friday Art Walk, one of the nation’s largest self-guided art walks; a pop-up gallery program; the Infusion arts initiative; and the Artlink Juried Exhibition, Art Detour, and Phoenix Urban Guide. Artlink keeps the arts integral to the development of our city by connecting artists, business and community. Artlink supports a variety of community-based art events, including complimentary Trolley Tours during the monthly First Friday Art Walk, one of the nation’s largest self-guided art walks; The Artist Forward Fund (TAFF); a pop-up gallery program; the Infusion arts initiative; and the Artlink Juried Exhibition, Art Detour, and Art d’Core Gala. 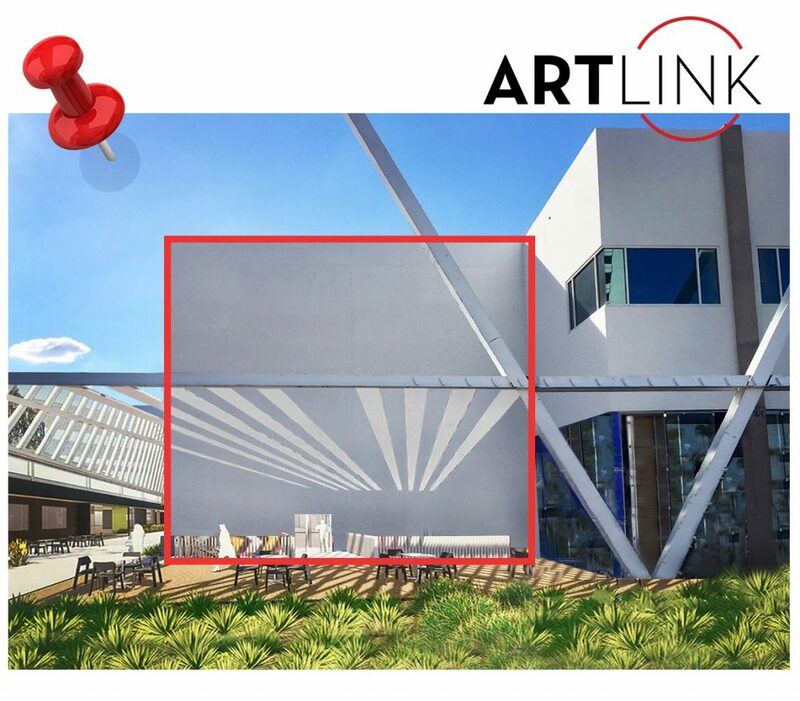 Artlink is a 501(c)(3) nonprofit organization and is supported by City of Phoenix Office of Arts and Culture, Downtown Phoenix Inc., Arizona Commission on the Arts, Phoenix Art Museum, The Arizona Republic, Dunn Transportation, Roosevelt Row CDC, Phoenix Warehouse District, Central Arts District and Historic Grand Avenue. 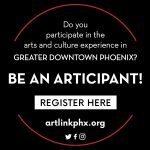 Visit www.artlinkphx.org to sign up for the Artlink newsletter or connect socially on Facebook, Twitter and Instagram. 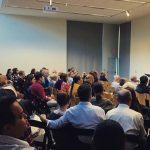 Artlink’s 2017 Annual meeting was held on Wednesday, June 14, at Phoenix Art Museum. 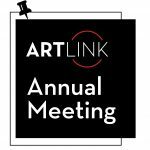 The Artlink board welcomed 110 attendees, including artists, arts advocates, and representatives of the City of Phoenix, galleries, performing arts, and other arts organizations. Present Board Members: Catrina Kahler (President), Sally Russell (Vice President), Dan Clevenger (Secretary), Rick Naimark (Treasurer), Constance McBride (Arts Committee Chair), Hillary Foose, Bentley Calverley, Nicole Underwood, Margaree Bigler (PR Committee Chair), and Rembrandt Quiballo. Not present: Jerry Harper and Brittany Butler. The meeting opened with a video introduction of Artlink, followed by a welcome from Artlink board member Margaree Bigler, representative of Phoenix Art Museum. Margaree introduced honored guest, Amada Cruz, Sybil Harrington Director and CEO of Phoenix Art Museum. 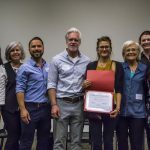 Amada congratulated Artlink on the pending 30-year anniversary Art Detour and lauded the hard work of community investment in the urban core over that time. Upon coming to Phoenix, she asked who “owned hip” in the Valley and it was very clear that it was downtown. The reason Phoenix Art Museum is thriving is because of all the hard work invested by those here; it takes this ecosystem of people to make a city great. The Museum is thrilled to be partners and looks forward to the next 30 years. Artlink President Catrina Kahler proceeded with the meeting, beginning with the election of the 2017-2018 Board of Directors. Thanks were given to past board members Jill Bernstein, Sarah Levi and Mark Scarp who stepped down from the board earlier this year. Bernstein had served on the board since 2011. The board thanks them for their significant contributions. Catrina provided an overview to the organization statistics included in a “by the numbers” annual report that reflected the past year’s work of Artlink, an organization whose operations are managed by a volunteer board of directors. The report includes the number of Art d’Core Gala attendees (600+); the Juried Exhibition sales ($16K) and awards given to artists from Artlink ($7750); the growing number of Mixed Media attendees (150+); and the number of submissions to artist calls (471). 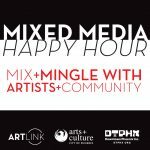 The next Mixed Media Happy Hour will be scheduled in July. The board expressed its gratitude to Downtown Phoenix Inc., for its partnership in printing First Friday maps. Catrina introduced Artlink Treasurer Rick Naimark who reported on Artlink’s 2016-2017 finances. 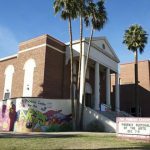 The emphasis on this year’s budget was on one-time investments that included Phoenix Urban Guide development and an updated brand and logo for the organization. The annual budget is approximately $75,000 to $80,000, much of which composed of sponsorships, grants and in-kind contributions. Articipant fees account for one percent of the budget. 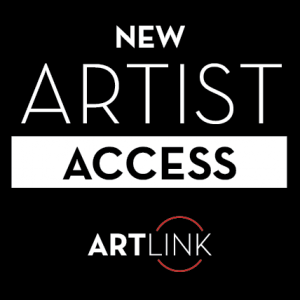 Artlink will be looking at ways to connect with organizations who are interested in connecting with artists. Catrina introduced the new TAFF program. 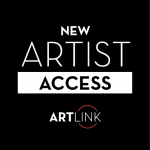 Artlink allocated $500 to the initial grant and is looking to make a long term commitment to the fund and its growth. As a step in this direction, it was announced that For the People owners, Shawn Silberblatt and Chad Campbell, agreed to sponsor the new program by matching this initial grant, bringing the total grant funds to $1000. Catrina introduced Vice President Sally Russell and Arts Committee Chair Constance McBride. Sally spoke to the importance of TAFF as a means of supporting artists. Constance emphasized the need for the arts community to grow along with the city. 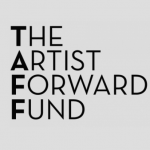 TAFF represents a new way to support, and mentor, artists. The Artlink Artist Council (AAC) was formed from a diverse group of established professional artists: Julie Anand, Joan Baron, Christine Cassano, Bill Dambrova, Peter Deise, Isaac Fortoul, Gabriel Fortoul, Frank Gonzales, Annie Lopez, William LeGoullon, Ann Morton, Joe Ray, Patricia Sannit, Randy Slack, Marilyn Szabo. Constance introduced AAC member Joan Baron to announce the recipient of the first TAFF grant, Ashley Czajkowski. Ashley expressed her thanks and looks forward to the mentorship opportunity. Approximately 75% of the attendees were familiar with PUG. Catrina spoke briefly to the functionality of the site and the opportunity for both artists and arts destinations to upload their exhibition information. 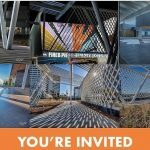 Artlink is partnering with the Phoenix Office of Arts & Culture on the development of the new calendar function, which will represent a single connected voice for the arts and culture community. Nicole Pasteur, representative of the Office of the Mayor, was in attendance and recognized for the City’s support of Artlink. Artlink originated from the Art Detour event, which will celebrate its 30th anniversary in 2018. It’s not just an event for the public; it creates connectivity and community within the arts and culture community. 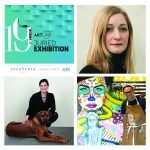 The dates for Art Detour 30 will be on the Third Friday weekend in March 2018: The Art d’Core Gala will once again be an opening night event on Thursday, March 15; Friday through Sunday will be the “Detour”; and Monday/Tuesday will be a series of symposiums that will focus on artist career development and the intersection between the arts and the community at large. Planning for the weekend Detour may evolve so that the event activity and promotion can be more focused. Each day presents an opportunity to focus on a specific district. The 30 year logo was unveiled with an invitation to everyone to suggest topics for the symposiums planned for the event. A question was asked about trolley service during the weekend. The trolleys will likely run Friday through Sunday but the programming plan needs to further develop. 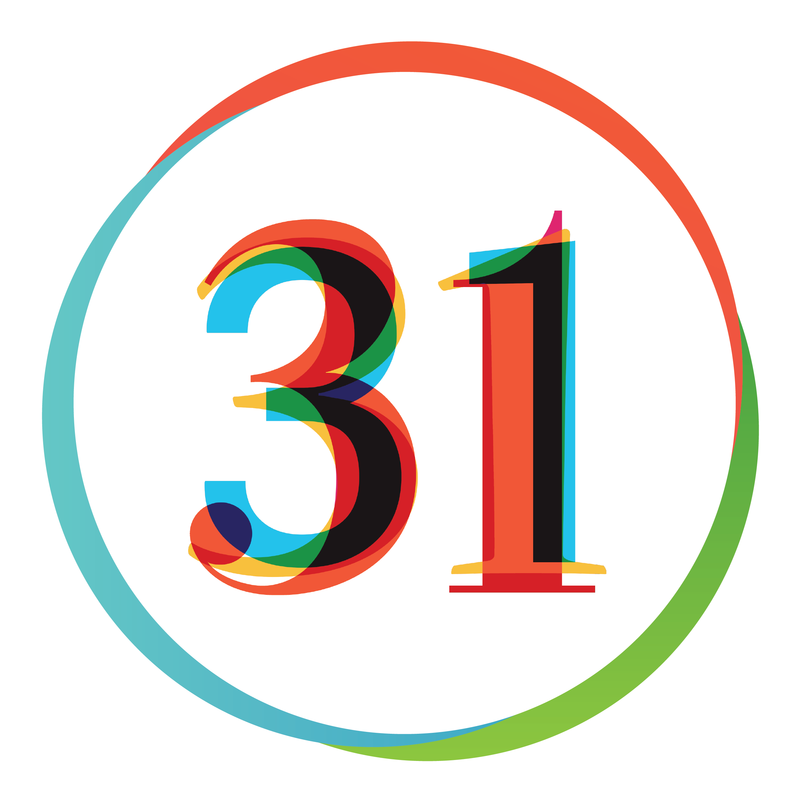 The goal of Art Detour 30 is to further establish Phoenix on the national arts and culture map. To do this, there is a need to focus on the quality of art, as well as the number of artists and the quantity of arts experiences. 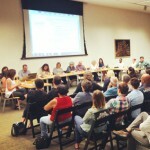 A question was asked about the timing of Art Detour on the same weekend as Mesa’s Spark Festival. Artlink was pressed in recent years to maintain a consistent Art Detour weekend and committed to the Third Friday weekend. 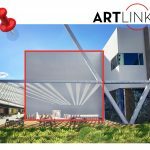 Artlink is interested in connecting Phoenix and Mesa, and finding a regional connection. 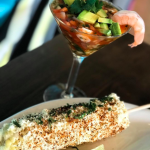 Other comments referenced events such as Art Basel and Vivid that build energy and create geographical cohesiveness by connecting arts events happening in multiple areas of a city. Dorina Bustamante, representing Downtown Phoenix Inc., spoke to the opportunity to connect and become more of a national draw. Catrina confirmed that Artlink is open to collaboration. Thanks to West Elm, a national retailer that supports local artists and is opening at Uptown Plaza, at Central and Camelback, on June 29. On June 28, there will be a pre-grand opening event and a portion of the proceeds with benefit Artlink. Special recognition was given to Leslie Criger, who serves as operations support for Artlink, acting as Articipant liaison, and volunteer coordinator. Artlink is making a commitment to pursue grants so that it may grow with energetic and skilled staff that will support the growth of the organization moving forward. 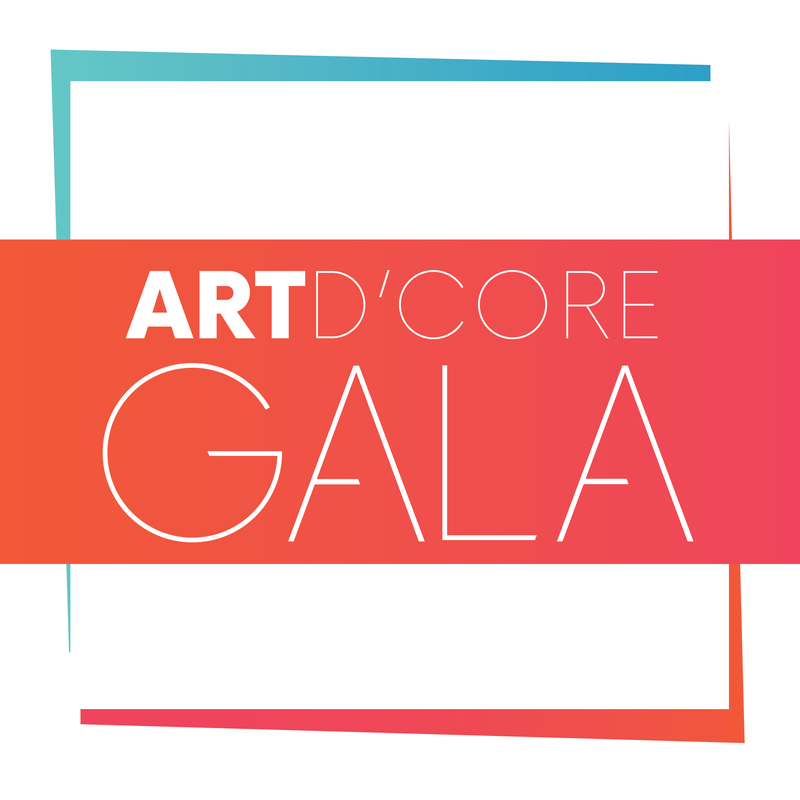 Tickets are available for the 5th annual Art d’Core Gala, a celebration of the Phoenix arts and culture community from 6 to 9 p.m. Thursday, March 16, at Warehouse 215 at Bentley Projects, 215 E. Grant St. The Art d’Core Gala will feature a one-night-only exhibition of works presented by an inaugural collaboration of a group of Arizona-based artists who have committed participation and support to a new Artlink initiative. Works by Christine Cassano, Bill Dambrova, Pete Deise, Jeff Falk, Fortoul Brothers, William LeGoullon, Annie Lopez, Ann Morton, Rembrandt Quiballo, Joe Ray, Randy Slack, and Marilyn Szabo will be on display during the event. These established professional artists have worked 10 years or more in exhibiting and/or producing exhibitions that shine a spotlight on Phoenix; represent the diverse cultural identity of our city; and have contributed significant time/energy to either Art Detour/Artlink and/or partner initiatives that strive to elevate the profile of Phoenix’s creative community. Art d’Core serves as the kickoff to an “Artist Forward” Art Detour 29 weekend, March 16-19, a four-day, multi-faceted exploration of the arts and culture of America’s sixth-largest city. All are invited to celebrate, support and enjoy the festivities, including music and dancing, and a no host bar. 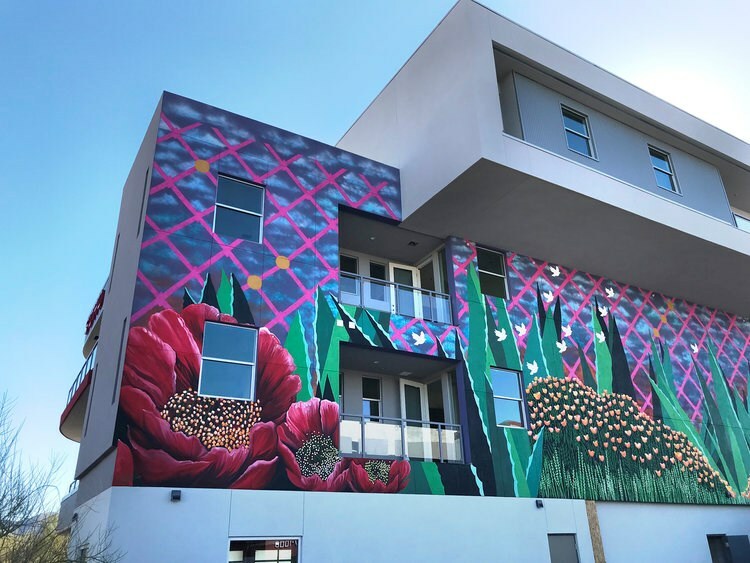 This creative spin on a traditional gala is hosted by Artlink in partnership with the City of Phoenix and Downtown Phoenix Inc. at Warehouse 215 at Bentley Projects, in the heart of the emerging and dynamic Warehouse District. Tickets at $10 per person, $15 per couple are available until 6 p.m. March 15 at artdetour.com. Tickets will then be available at the door for $15 per person, $20 per couple. Come as you are; creative cocktail attire encouraged. The event is a fundraiser for Artlink, an active all-volunteer 501(c)(3) non-profit organization, with a portion of the proceeds dedicated to a new artist development fund designed to help provide direct financial support to local artists. Artlink keeps the arts integral to the development of our city by connecting artists, business and community. 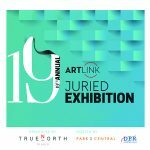 Artlink supports a variety of community-based art events, including complimentary Trolley Tours during the monthly First Friday Art Walk, one of the nation’s largest self-guided art walks; a pop-up gallery program; the Infusion arts initiative; and the annual Juried Exhibition, Art Detour, and Art d’Core Gala. 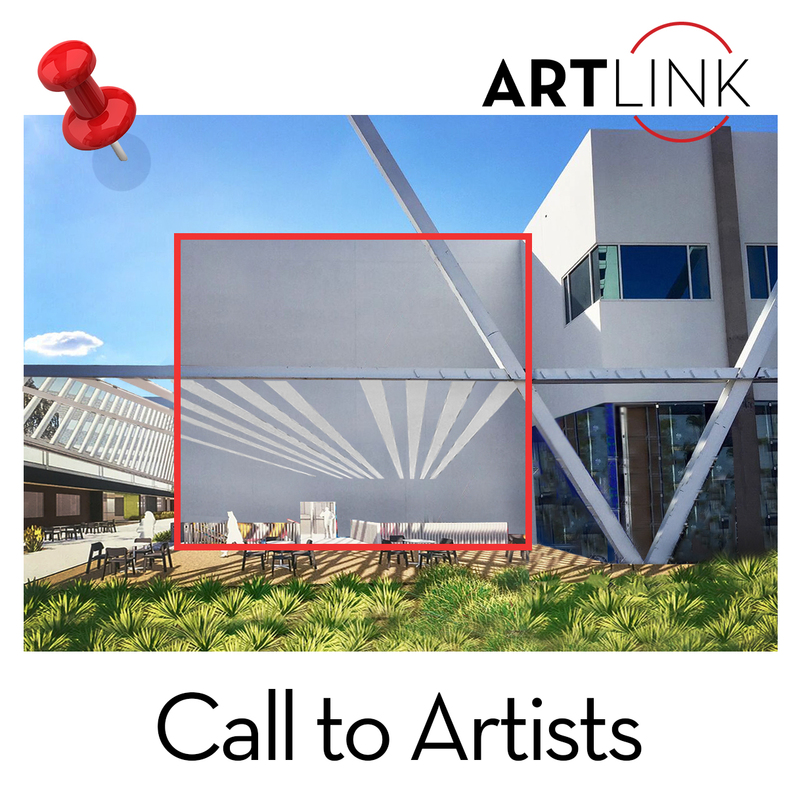 Artlink is a 501(c)(3) nonprofit organization supported by the City of Phoenix Office of Arts and Culture, Downtown Phoenix Inc., Arizona Commission on the Arts, Phoenix Art Museum, The Arizona Republic, Dunn Transportation, Roosevelt Row CDC, Warehouse District, Central Arts District and Historic Grand Avenue. Visit www.artlinkphx.org to sign up for the Artlink newsletter or connect socially on Facebook, Twitter and Instagram. Two events are scheduled to bring together participating artists and arts businesses to create a bigger and better Detour experience for patrons. 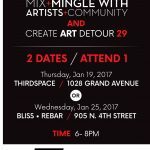 Artlink invites its “Articipants” — area artists, art venues, business and community members who regularly participate in the Phoenix arts scene — to attend one of two happy hour events in January to celebrate and collaborate on ideas for the upcoming Art Detour 29. Jan. 19, 6 to 8 p.m.
Jan. 25, 6 to 8 p.m.
Join us at the first “Mixed Media” Happy Hour! All Artists, arts entrepreneurs, businesses and advocates who contribute to the arts and culture experience in greater downtown Phoenix. Mix, mingle and get the details about the 2017 Articipant Program, Art Detour, Third Fridays and more! Location: The Grand Central Coffee Co. 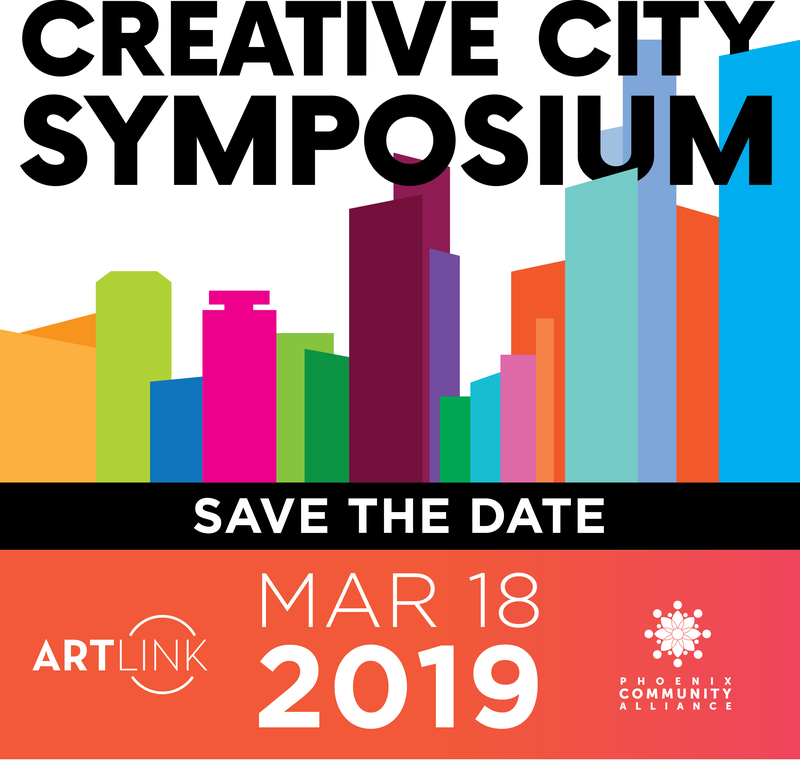 Hosted by Artlink, City of Phoenix Arts & Culture Office, Downtown Phoenix Inc.